Believe it or not, it is almost basketball season again. John and Matt turned on a college game the other day and John said to me in the most serious voice, “Wow. Mom, I can’t believe I’m watching basketball with Dad at last.” It wasn’t Middlebury basketball, but it’ll do until next week. And that’s when the fun really starts. When I tell people that John follows the Middlebury basketball team, they smile and nod, because their kids also watch sports. It’s tough to fully explain this crazy level of commitment that even I sometimes find hard to understand. 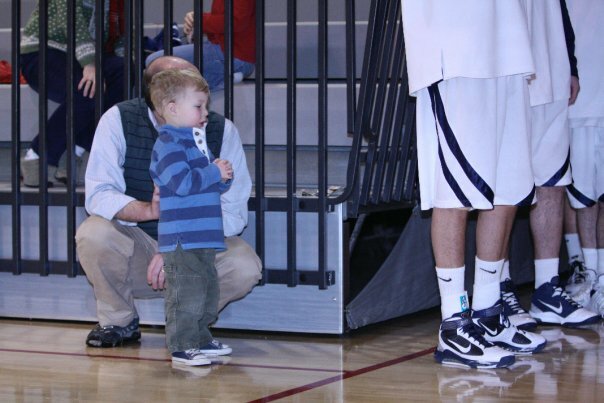 John’s gone to all the Middlebury home games since he was in diapers. He eagerly embarks on road trips of up to five hours for away games. He remembers the Middlebury players from the past four years, and many of the opposing players, too. He remembers details of games that I don’t even remember going to. I’m really just there to provide snacks and save his seat for after he high fives the team during warm ups. As I’ve said before, even a non-sports fan like me can see a lot of good in this. I think the Middlebury coach, Jeff Brown, consistently recruits teams that are not just good players, they’re good people. When we go to basketball games, John’s seeing sportsmanship, dedication and teamwork. And effort! My god, these boys work hard. He’s surprising clued in to game strategy, which I think Matt loves. And as an added bonus: math skills from keeping track of the score. It’s a win-win-win. A big bundle of win. Every year, I wonder if we’ve seen the last of the Middlebury Basketball Fandom. I assume that at some point John’s own activities and social life will take over. Or maybe his interest in basketball will wane, as his love of dinosaurs has. But I see no signs of it yet. It’s almost basketball season and at our house, that’s like saying it’s almost Christmas. First home game: November 19th. This brought tears of joy to my eyes. Midd is such a special place for all sorts of reasons, but most people don’t figure that out until they are of college age. I would say that John is one lucky guy! But that team is very lucky to have John’s enthusiasm as well.